Photos by Ozzie Hoppe. 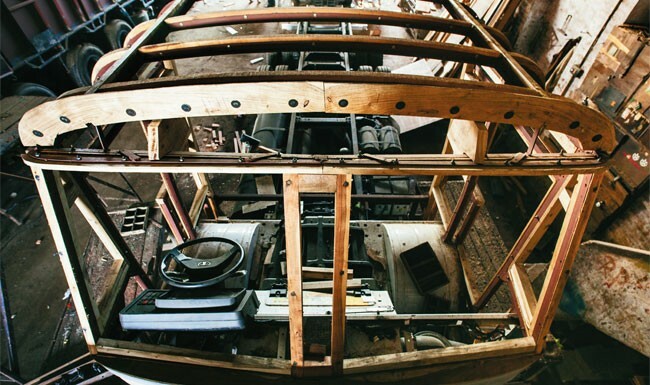 Truck cabins have an underlying exoskeleton made of sal wood, which is why one can often see them crushed beyond recognition in grisly accidents. Introductory blogpost for my project with photographer Ozzie Hoppe commencing in the last week of March. Do visit our website. TRUCKS IN INDIA are not merely motored beasts of burden. Neither are they a gender-neutral ‘it’. Most truck drivers only refer to their vehicles as an affectionate ‘she’, as a sturdy companion offering both the warm intimacy of a devoted wife and the security of their faraway homes. Perhaps, that is the reason drivers embellish their vehicles with the attention to detail usually reserved for a bejewelled bride on her wedding night. One can only indulge in symbolic speculation, for the origins of this socio-cultural phenomenon remains obscured in mystery. However, what’s undeniable is that colourful hand-painted trucks are one of the signature highway spectacles of the Indian subcontinent, often making dreary road trips a near-psychedelic experience. Truck art motifs include the ubiquitous Horn Ok Please, roses, peacocks, lotuses, elephants, an eagle perched on a globe, verdant village scenes, suckling cows, a pair of doves, religious verses, mythological totems, auspicious sayings signifying favourable luck on hazardous roads and warding off evil eyes, among many others. However, the surface uniformity of truck motifs can be deceiving since it belies a few choice personal flourishes: most trucks also reflect their owners’ personal life mottos in the form of witty aphorisms and unsolicited bits of startlingly personal advice. Also, while the first impression of decorated truck bodies is a riot of bright colours, they hide behind their exuberant facades a wealth of subtle markers which are telling signs of which state the truck was decorated in. For the abundance of truck art is testimony to an underground and unsung army of painters who decorate trucks while paying heed to an unspoken and undocumented aesthetic convention, one that is passed across generations as a traditional family occupation. Significantly, most truck decorators consider themselves artists and not craftsmen, thus cementing their occupation’s position as classic outsider art. Sources in the transportation industry tell us that some of the bigger hubs for truck decoration are Indore, Jodhpur, Vijaywada, Sirhind and Belgaum. We will be visiting these places in the course of our project and glean from truck decorators the reasons for this uncanny consistency in motifs sans any organized means of perpetuation and in the process, gain an anecdotal history of this uniquely subcontinental phenomenon. Can Urzza Quench Ramesh Chauhan’s Thirst?
. Further, the low-margin nature of the bottled water business is also driving Chauhan to diversify into the energy drinks business that delivers much higher returns and provides some measure of cross-subsidisation. “It is a simple calculation,” says a long-time distributor of mineral water based in Mumbai. “Currently, Bisleri is the only company in India that exclusively sells mineral water. Consider this: you pay only Rs 20 to buy a 1 litre bottle of Bisleri while you pay around Rs 40 for the same bottle of Coca-Cola. The input costs for both are roughly the same, you can add Rs 1-2 for Coca-Cola’s costs to account for the additional flavor and soda, while the margins are more than double that for Coca-Cola. It is natural for a company such as Bisleri to diversify.” Given Bisleri’s slender profit margin of 3% in 2013 in the mineral water business, it becomes difficult to counter such unassailable logic.
. While the FF beverage market is more diversified in international markets such as the US, the UK and Japan, it is divided into two broad segments in India — energy drinks and sports drinks — which are dominated by Red Bull and Gatorade, respectively, and a smattering of smaller players such as Tzinga, promoted by Hector Beverages, and Cloud 9 by Goldwin Healthcare. “There are no rules here. All the companies are working in an experimental mode to open up this market,” says Ankur Bisen, senior vice-president, retail, Technopak. Take the case of Urzza: Bisleri is positioning it as a liquid charger — a product that can be had by anyone, anytime — for a quick infusion of energy. Its price tag of Rs 50 for a 250 ml can is at a premium to soft drinks but lesser than energy drinks such as Red Bull and Monster, which are priced at around Rs 100 for a 350 ml can. Chauhan claims he is trying to create an new category. “I don’t want it to be branded as an energy drink. The energy drinks market is very small. We are aiming for bigger things. We want a product that tastes good, is refreshing and works as a pick-me-up. Urzza is not an energy drink but a power drink,” he says. Chauhan claims he spent two years developing a taste that is ‘interesting and intriguing’. “In India, drinking a soft drink is an experience, unlike in America, where it is looked upon as a washdown because their food is so dry. They’re not conscious of brand or taste,” he says. In 2012, the Food Safety and Standards Authority of India (FSSAI) mandated that beverages such as Red Bull, Monster and Burn that contain more caffeine than the permissible limit of 145 parts per million should be named as caffeinated beverages. FSSAI also ordered these beverages to display statutory warnings that the products are not recommended for “children, pregnant or lactating women, persons sensitive to caffeine and sportspersons”. By excluding caffeine, Chauhan intends to target a wider base of customers including both “children and grandmothers” and integrate his product into the lifestyle of “upwardly mobile” consumers. “Just like people have tea the first thing in the morning, we want this product to be consumed all the time. That’s why we kept caffeine out since there are objections against it,” says Chauhan. He says that he intends to conduct promotional campaigns in schools and colleges to promote daily consumption of Urzza. But, for now, Bisleri is targeting the upwardly mobile in the age bracket of 16-25 years through its marketing campaign. This sentiment is echoed by Mohit Ahuja, senior vice-president, Soho Square, which handles Urzza’s ad campaign. “We want to target consumers of both soft drinks and energy drinks. That is one of the reasons why we deviated from the norm and launched Urzza in PET bottles and cans. This gives us shelf placement near both soft drinks and energy drinks. We want to massify the energy drinks segment,” he says. While the advertisements are targeted at young adults, the consumer target encompasses all age groups, clarifies Chauhan. He adds that the reason they’ve also launched Urzza in a PET bottle is to facilitate mobility. “The customer can just cap the bottle and take it away. Also, he can see the drink. We’ve launched it in a can as well because the image of an energy drink requires us to sell it in a can. Otherwise, bottles are more functional,” he says. Most energy drinks advertise that the consumer derives energy not from the calories contained in them but from a carefully concocted combination of caffeine, vitamins and herbs. Urzza carries no such disclaimer. “The notion that energy is only derived from caffeine has been falsely perpetuated. Colas contain caffeine too. In reality, the key energy is derived from the sucrose. We have to change the way energy drinks are perceived,” says Ahuja. Sharmila Sandeep, marketing head at Bisleri, says that caffeine is a stimulant and not a source of energy. “As mentioned in the ingredients, our product contains vitamin groups B and C as well as tartaric acid, which aids in digestion,” she says. Clearly, the fact that caffeine is equated with energy in the Indian consumer’s mind is not lost on Bisleri. 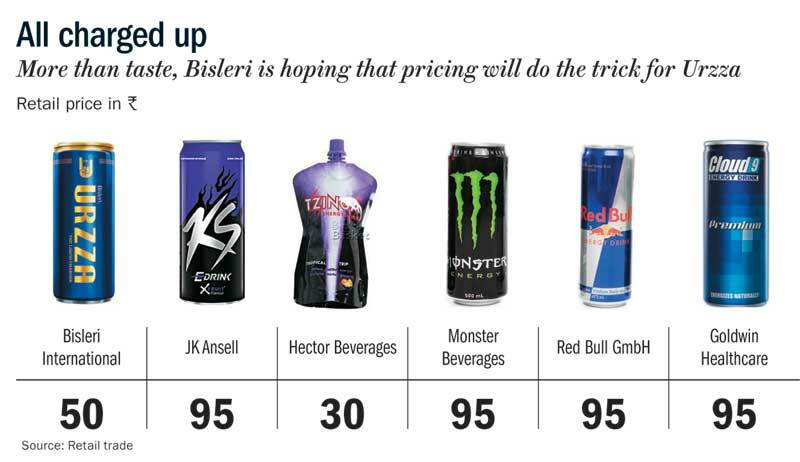 However, Bisen feels that the energy drinks consumer is too young to make such mature choices and believes that Bisleri is not too late to the party. “The market has only grown over the past two to three years. Right now, the reference point for any energy drinks consumer is Red Bull, which had a first-mover advantage. They think energy drinks are supposed to taste like that. But there are many people who have not tasted energy drinks yet,” says Bisen. Bisleri can target this segment and achieve traction through a two-pronged strategy — a strong push along its well-established distribution network and an aggressive marketing campaign that emphasizes its key differentiator — an agreeable taste. 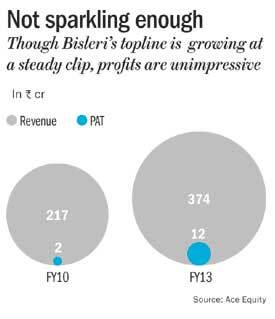 Bisleri’s formidable distribution clout, with 13 owned plants, 34 co-packers and 16 packers covering a retail base of around 5 lakh outlets, is a key advantage that the company has over its competitors. “Wherever Bisleri goes, Urzza will follow,” says Chauhan. This includes both off-trade outlets such as supermarkets and kirana stores as well as on-trade sales outlets such as restaurants, pubs and cafes. According to a Euromonitor report dated July 2013, 13% of all energy drinks sales in 2012 were through the on-trade segment. Bisleri has also launched a 360-degree marketing campaign encompassing all key mediums — TV, print, radio, digital and outdoor. The product is positioned as a premium drink for youngsters but Ahuja says they might target other age groups in future TVCs. “We need to justify the price. That is where the taste and imagery comes in. We have chosen international locations and international models in order to create a premium image and buy into the aspirational zone,” says Ahuja. “Gold is a premium colour, which is why we decided to use it on the can,” says Sandeep. But if taste is a key differentiator, why has Bisleri not advertised the same? Ahuja says that they haven’t made taste the pivot of the TVCs, because taste needs to be discovered. “However, in print and outdoor advertising, we have positioned it as an ‘awesome-tasting’ drink,” he says. Also, why the double z? Chauhan says he doesn’t like four-letter words since most of them bring to mind swear words. He says that’s the reason he added the double a in Maaza. “Five-letter words are wholesome. Also, the pronunciation of the letter z varies within Indian languages. To make the pronunciation very clear to consumers, we made it a double z,” says Chauhan. When asked about why he chose a brand name derived from Hindi when his target consumers are yuppies, Chauhan retorts that people will soon forget it as a desi name after two to three months of advertising. “Maaza, which also has a desi name, has done really well internationally in the European and American markets. Instead of the name, it is the image you create around it that matters. The important thing is that it should be simple, easy to remember and should sound good,” he says. Chauhan has invested Rs 100 crore in five manufacturing facilities of Urzza at Bengaluru, Rudrapur, Kolkata, Mumbai and Ludhiana. Four of these are new factories, while one Bisleri factory has been equipped to manufacture Urzza. The company will source from two third-party manufacturers based in Pune and Indore. He has put in a further Rs 100 crore for marketing. Chauhan says he entered the beverages market after realising that the buzz around the energy drinks market did not match up to the sales. He finds it to be a latent market, one that is both a challenge and an opportunity. However, Harminder Sahni of Wazir Advisors is quite intrigued. “India is not a very fitness-oriented country and we are mostly water drinkers. In fact, the upwardly mobile segment is such that it needs to burn calories. I want to know what research companies do in order to arrive at the conclusion that the Indian market is ripe for energy drinks,” he says. With the cost of an Urzza can coming to Rs 6.25, and the estimated capital costs (electricity, land, machinery) for producing one can amounting to around Rs 10-12, the input cost of producing is not more than Rs 20-21, says another Bisleri distributor. Currently, Bisleri derives revenue of Rs 35 per Urzza can, excluding excise and sales tax, thus netting a cool Rs 12-15 per can of Urzza. The product is pushed to the retailer packaged as a six-pack at an average price of Rs 40, leaving him a neat Rs 10 spread. Competitors such as Red Bull offer a 15-20% margin along with attractive package deals; Bisleri will need to match these levels. 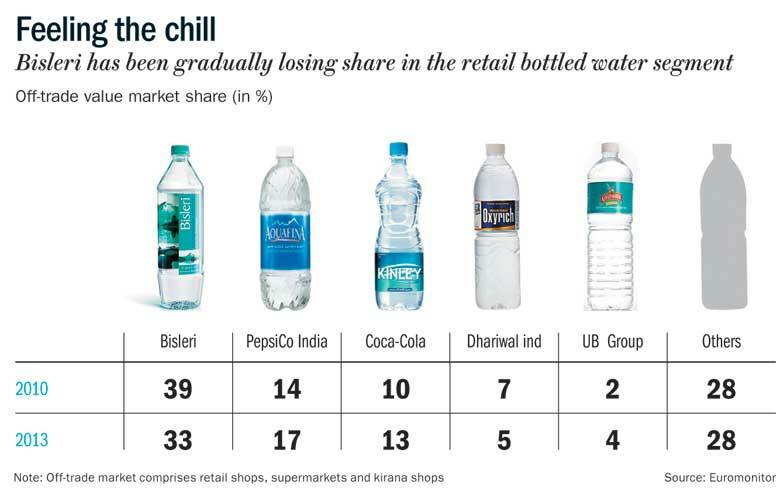 In comparison, with Ebitda margins hovering around 10% in the last three years, it can be estimated that a 1-litre bottle of Bisleri water sold to retailers at Rs 20 fetches the company around Rs 2 per bottle. Keeping these figures in mind, it is not difficult to guess why Chauhan is looking to diversify. Bisleri also may be suffering thanks to aggressive competition. A retailer based in Santa Cruz in suburban Mumbai says, “During the summer season, my shop is filled with Aquafina bottles that Pepsi provides me free of cost along with bottles of Pepsi and Mirinda. I don’t need to buy any Bisleri at all.” However, Chauhan strongly denies any decline in market share. “The data showed by Euromonitor only covers retailers. It doesn’t include the direct distribution that Bisleri does to homes, corporates and the horeca (hotels, restaurants and canteens) segment,” he says. But what is very clear is that though revenue is growing 20% every year, with Rs 12 crore PAT on revenue of Rs 373 crore, the water business is not impressive enough. With a balance sheet size of Rs 142 crore in 2013, it is certainly bold on Chauhan’s part to invest Rs 200 crore into Urzza. Chauhan aims to garner 10% of Bisleri’s volume sales by the end of one year. 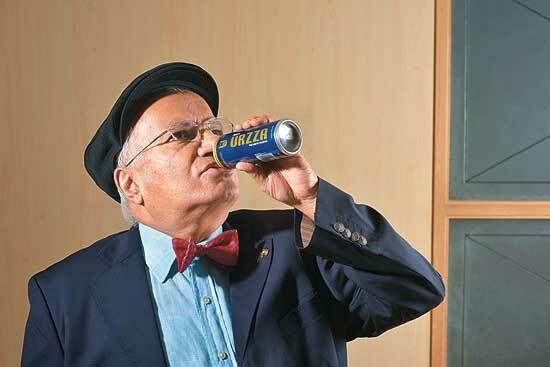 “We aim to sell 24 crore cans of Urzza within one year and garner around Rs 800 crore of revenue,” says Chauhan. While it’s too early to comment on the product’s commercial success, the very fact that Urzza lacks a clear competitor, doesn’t conveniently fit into any pre-existing product category and doesn’t advertise its source of energy, might go against the beverage. “Presently, market reviews are 50% good and 50% bad. The 50% bad reviews are because consumers are accustomed to the taste of Red Bull and Monster. It’ll take time for Bisleri to make inroads,” says a Mumbai-based retailer. However, another retailer says that customers have started asking for Urzza after the TVC has aired. Chuahan, a brand veteran, is convinced that his product’s taste and pricing will click with consumers. “They have the money and they want something extra. Urzza is a premium luxury drink that fits the bill,” he says. What about the other players who are targeting the same customer segment? “We do not have any competitors,” he reiterates. Only time will tell if this brand veteran, indeed, has got the Midas touch. Rewind 10 years. There is no neem tree. Instead, a dusty wasteland caked with the white residue of salt stretches endlessly. When it rains, the air does not resonate with the sowing song of women in the fields. Instead, they are flooded with waist-deep water that makes cultivation impossible. Entire families of small-scale cultivators migrate to the Kathiawar peninsula, to cities like Rajkot and Jamnagar, looking for itinerant construction work. Today, Keshaben points to the tree and reminisces, “Birds find it difficult to leave their nest in the trees, imagine how difficult it must have been for us to leave our homes.” An area that grew no crops throughout the year is now growing two crops annually. The principal point of difference between then and now: one magical word, Bhungroo (drinking straw in Gujarati). It is impossible to not like Biplab Paul. He greets everyone with a booming ‘Good Morning’ charged with such infectious energy that it actually makes your morning better. He laughs heartily and often, at the smallest of jokes, with the utmost sincerity. He makes for quite a curious manifestation of India’s heterogeneity: a syncretic product of Bengal and Gujarat. A native Bengali from Chinsurah and an economics graduate from Jadavpur University, 44-year-old Paul has settled in Ahmedabad since 1995 where he undertook a course in environmental education at the Centre for Environment Education. The image of a little girl in Sami taluka of Patan district quenching her thirst by sliding down a ditch to slurp muddy water left a strong impression on Paul’s mind. In his travels around rural Gujarat as part of the NGO Lok Vikas, he was intrigued by a peculiar dichotomy in the nature of water scarcity. The modest quantity of rainfall the state receives is concentrated in a short period of 15-20 days, leading to water logging in the peak cropping season. For the rest of the year, the state experiences severe water-scarcity. Landed small-scale cultivators are thus forced to abandon their fields and go looking for employment elsewhere.An idea came to Paul’s mind: what if there was a way to store this excess water underground and pump it out for use in the dry spells? His invention, Bhungroo — an irrigation device that costs around Rs 3 lakh to 5 lakh, which is around one-tenth the cost of a borewell and one-third the cost of a tubewell — was thus born. What exactly is a Bhungroo? Bhungroo is a pipe, typically 4-6 inches in diameter, that is drilled into the ground upto a depth of 60-110 feet at the lowest point in the catchment area of fields prone to water logging, ensuring that the excess floodwater flows into it due to gravitational pull. It takes up an area of roughly 1 sq m. The design and depth of the pipe depends on agro-climactic and soil conditions. A filtration mechanism at the opening ensures that topsoil and other impurities do not manage to enter it. A perforation chamber is made in the Bhungroo at a spongy soil layer capable of absorbing water and the rainwater is guided here, creating an underground water reservoir. Each Bhungroo has a capacity to drain the water from 5-7 acres of land, drawing an average of 2 million litre per unit. Diesel pumps are used in the winter to pull up the water and can irrigate 20-30 acre of land. It also helps reduce desertification because the fresh rainwater going into the ground mixes with the saline groundwater and reduces the overall salinity of the land. Paul has an inventory-less model wherein he locally sources all the material and labour required to erect the Bhungroo, including the PVC pipes and drilling equipment. Firstly, the material is transported to the site of erection, which incurs a cost of Rs 20,000-30,000. The drilling requires six men to drill for a period of 12 days with the labour costing around Rs 70,000. Drilling costs vary, depending on whether it is done by machine or manually. Typical drilling costs come up to around Rs 1 lakh but often vary depending on the depth at which the spongy soil layer in the ground is found.In 2001, when Paul first set out on the lonely journey to implement Bhungroo with no scientific knowledge, he had many hurdles to reckon with. He first taught himself hydrogeology to understand the issues involved. “We moved from failure to failure,” he says. “But unlike Bengali parents, Mother Nature is a kind teacher who doesn’t punish you for failing. She embraced me and taught me every time I failed.” It was also difficult to convince illiterate, technology-averse farmers to try out his innovation. “Most of the people Bhungroo serves have been oppressed in some way all their lives. They are not very trusting of new people or new ideas. They think it is yet another way to swindle them of their money. It was difficult for us to get them to accept Bhungroo as a beneficial technology,” says Paul. “The first time, they thought we were all liars. The second time they thought since we’re coming back we must have something. When they finally saw us get on with the drilling, they were convinced we were serious about what we were doing,” says Shaileshkumar Jadav, a Lok Vikas volunteer who has been closely associated with the on-field implementation of Bhungroo in Sami taluka of Patan district. At this stage, Paul along with his wife Trupti chose to use women as the medium of transmission for his idea since most male members of their families were not available, having migrated to cities for employment. Upon interaction, he discovered women to be more resilient to failure, less egoistic and more patient with his trial-and-error methods. 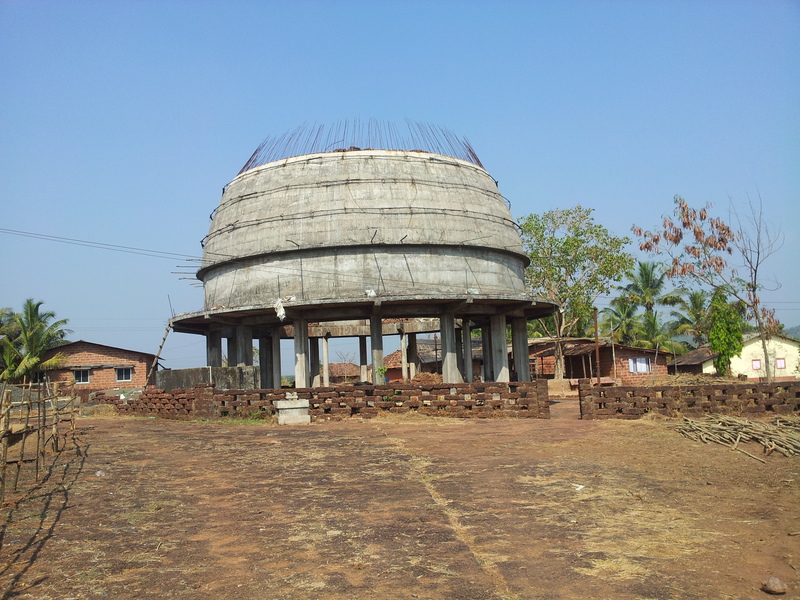 In 2006, Paul erected the first Bhungroo in Mota Joravarpura in Keshaben’s field, financed by his own and his wife’s savings. He was still in the initial stage of innovation with no ‘proof of idea’ and could hardly rely on any external funding. He calls Mota Joravarpura his ‘pilot project’ and has not charged a single paisa from the villagers for the Bhungroo erection. In 2007, he won the World Bank’s India Development Market Place Award, which opened doors for him in terms of funding and recognition. In 2008, the Gujarat Commissionerate of Rural Development in collaboration with Japan Fund for Poverty Reduction (JFPR), pooled in a grant of around Rs 1 crore to bring 500 BPL families in Patan district above the poverty line using Bhungroo technology. The implementing agency was Lok Vikas, as part of which Paul erected 100 Bhungroos in Sami with the assistance of Self Help Groups (SHGs) who were acting as advocacy units for the government. Based on his previous experience, Bhungroo was modelled such that it was collectively owned by five women belonging to poor farming households as part of a Joint Asset Group (JAG), an unheard-of phenomenon in the highly capitalistic Gujarati society. “Mohammad Yunus came up with the idea of Joint Liability Group (JLG) in Bangladesh. We used this model to form a JAG instead. Why do you want to distribute debt when you can distribute a long-term asset?” asks Paul. Bhungroo’s growing popularity and success encouraged Paul to devise a business model. 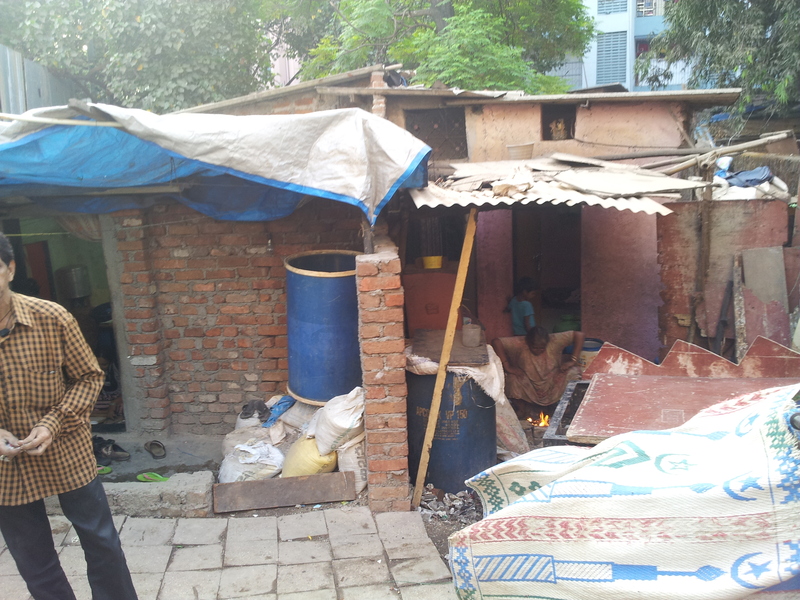 Thus, Naireeta, a social enterprise was born in 2011. According to the initial business model, the JAG paid their dues to Naireeta for services and Bhungroo construction over five years by giving them 30% of their winter cash crop. Naireeta used to sell this on the open market and pay the financial institutions it borrowed from to install the Bhungroos. The excess water, if any, was sold by the commune to other small-holding farmers in repayment of either the diesel expenses or one-third of their winter cash crop. Paul constructed two Bhungroos under this model. For a one-time investment of Rs 3 lakh-5 lakh, Bhungroo generates an income of Rs 9 lakh a year for the commune and provides them lifelong food security. Typical break-even time for the commune is 36 months. In 2012 came the turning point when Bhungroo was officially adopted into Gujarat’s 12th State Budget as part of the state’s irrigation initiative, which saw Paul erecting 25 Bhungroos. During this period, Paul created a team of 13 SHG volunteers who had become self-sufficient in determining the site of Bhungroo erection and other technicalities apart from the depth of the Bhungroo, for which Paul had to be present occasionally. The Bhungroo initiative was soon handed over to this team, which has erected 2,000-3,000 Bhungroos in north Gujarat catering to around 14,000 farmers till date with nominal participation from him, says Paul. Until this point, Paul was still operating on a grant model and was not earning anything. In the same year, Paul won the Ashoka Globalizer Award and was soon advised by an international consultancy to forge tie-ups with capable organisations possessing a local presence instead of dealing with individual farmers. “Collection costs were high in the earlier model. Since most small-holding farmers are not connected to the banking system, we had to go ourselves to check on them,” says Paul.Consequently, Naireeta’s model took concrete shape. According to this model, Naireeta is approached by local organisations — NGOs, SHGs, or corporates intending to spend their Corporate Social Responsibility (CSR) fund — interested in implementing Bhungroo in their area of operation. So far, Naireeta has collaborated with the Deshpande Foundation in Karnataka and the Sophia Foundation in Odisha. Naireeta charges Rs 3,000-6,000 per day for sessions on the nitty gritty of on-field implementation of Bhungroo. “We have opted for an open-source model. Knowledge is our biggest asset and we want to spread the word. Right at the beginning, we decided we won’t patent the Bhungroo since it increases cost of access,” says Paul. The local partner is responsible for identification of beneficiaries and rural community mobilisation, while Naireeta is responsible for erecting the Bhungroo at an appropriate site. Under this model, Naireeta has constructed one Bhungroo so far in collaboration with Deshpande Foundation that fetched a revenue of Rs 6.6 lakh and a net income of Rs 1.6 lakh. Also, the Sophia Foundation has entered into a Schedule of Rate agreement with the Irrigation Department of the Odisha government for a trial unit of Bhungroo in Puri district, according to which one unit of Bhungroo is priced at Rs 7.5 lakh – 8 lakh, including material cost, local community mobilisation, labour, capacity building and training. The government provides the funds to Sophia, which will pay Naireeta a lump sum fee of around Rs 5 lakh for erecting the Bhungroo, this includes labour costs, machinery and transport costs, earthwork and drilling costs. Regarding the method by which Naireeta decides the quantum of money to be charged above its expenses, Paul has this to say. “Bhungroo is not a product but a service. We look at the organisation’s willingness and ability to pay, and then decide the amount of surplus to charge We invest our surplus in areas that desperately need the Bhungroo. We want to break even soon so that we are able to spread impact effectively,” he says. Apart from installation charges, Naireeta has other revenue streams specified in the contract: technology execution cost, the cost of adapting it to local conditions, and maintenance costs over the years. So far, Naireeta has clocked revenues of around Rs 7 lakh since 2012 from its operations and a loss of Rs 42,000 since it ran into some financial hurdles with its partner organisation in West Bengal because of which it could not get its dues. It has four salaried employees apart from seven members in the top management who don’t draw any salary. In addition, it has 19 rural volunteers who act as brand ambassadors for Bhungroo and advocate it in north Gujarat. Paul hopes to break even in 2017.While Naireeta has been successful in advocating the Bhungroo in Gujarat, he is now looking to scale it up to a pan-India level. In fact, in the long run he wants to introduce it in other countries afflicted by water-logging, like the South-East Asian nations and some African countries. He has already partnered with Conservation Alliance International to introduce the Bhungroo in Ghana. Uptil now, 220,000 hectare in Gujarat has been irrigated using Bhungroo, according to a report by the Gujarat Ecology Commission. “Bhungroo will have to reach a tipping point when there’ll be viral replication. It has been very successful in north Gujarat, because the farmers here are very aware and entrepreneurial in nature. Small-holding farmers elsewhere don’t have this mentality,” says Somnath Bandyopadhyay, professor of ecology at Nalanda University. For this, Bandyopadhyay says that an academically rigorous scientific evaluation will be essential to assess the impact of Bhungroo, much like the System of Rice Intensification (SRI) which began as a one-state initiative but is now being implemented in 11 states and is backed by Nabard. Also, scalability will be a challenge considering that if grants and financing don’t come from the government or other foundations, Naireeta will be unable to achieve scale, given that since 2012 it has only managed to install one Bhungroo under its new business model. Naireeta will also have to train soil engineers to identify locations suitable for Bhungroo erection, a job largely done by Paul himself. To remedy this information lacuna, Naireeta has forged tie-ups with knowledge partners such as Bihar Innovation Forum, which is popularising the innovation in its regions of operation by engaging with farmers and publishing the impact of Bhungroo. But Paul is ready to run the marathon and is busy advocating his innovation to the Centre and various state governments, convincing them to take it up as part of their official policy, just like the Gujarat government did in 2012. However, sensitizing the government is going to be an uphill ride. The government does not recognise water-logging as an official disaster, says Rajiv Sinha, professor of geosciences at IIT Kanpur. “Whatever the case, I’m game for it,” says a determined Paul. 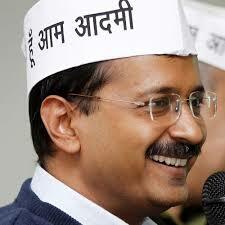 AAP Tamil Nadu: Democratic Revolution or Free-for-all Riot?